Kurt Bickler immediately thought of the Alfred Hitchcock classic "The Birds" when he saw his backyard buzzing with activity two weeks ago. Thousands of bees had formed a big, black, humming ball in his tree. "I had no idea what to do," said Bickler, of Palatine. "They were just dripping from the tree and it's not like you go to Home Depot and pick up a little bottle of bee spray." The rogue colony quickly garnered interest from local hobbyists, who are working to preserve a honeybee population that's been decimated due to a disorder with mysterious causes. 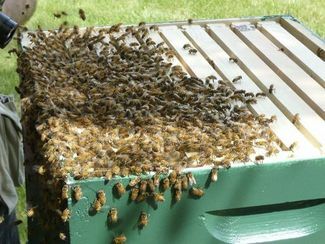 The phenomenon is of great concern to the Illinois State Beekeepers Association, which got wind of the swarm and put out a "bee-mail" to its members. Bickler got a response in less than 10 minutes and within an hour, there were six more calls from area beekeeping hobbyists pining for the unwelcome tree guests. First on the scene was Palatine hobbyists Ronald and Liana Winsauer, armed with crates, protective veils and jackets, and smokers "in case the bees are feeling cranky or upset." The Winsauers are among 1,300 registered beekeepers in Illinois who manage about 19,000 colonies. Though they joined the ranks just months ago, they identified the swarm as Italian honeybees and got to work. With Bicker's wife, Julie, their kids and pet Doberman secured inside, the Winsauers gave the branch a good shake and sprayed the bees with sugar water to keep them docile. The queen bee must have made her way into the wooden crate below, because a long flow of bees soon followed. The Winsauers returned a few hours later to find an empty tree and a full hive. "They behaved in a very textbook manner," Liana Winsauer said. 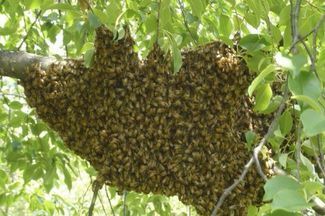 According to Ken Haller, president of the Illinois State Beekeepers Association, the tree was a pit stop for a newly formed colony which would have left on its own accord within a week. A strong, healthy honeybee colony can consist of one queen, a couple of hundred drones and about 60,000 workers. Haller said the original colony likely had a new queen that was two or three days away from emerging and taking, prompting the soon-to-be ousted queen to leave and take with her half the swarm. "(The existing queen) knew to leave," said Haller. "They were simply resting up until they found a new home." It's the third colony for the Winsauers, who've kept hives in the center of their fenced backyard since April. Liana Winsauer said she's been interested in the hobby for a few years and that she and her husband plan to use the honey for cooking and making mead, also known as "honey wine." They harvested the first batch of honey two weeks ago, and weren't disappointed. "Last fall we went over to visit a friend's hive in Chicago and just decided to go with it," she said. 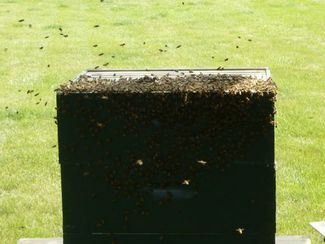 The Winsauers are the only beekeepers on the books in Palatine, but reports show 649 colonies in Cook County and 265 in DuPage County. Honeybees pollinate about one-third of the human diet and add about $15 billion in value to more than 90 crops, according to the U.S. Department of Agriculture. They're also dying off at alarming rates. In 2006, beekeepers reported losing up to 90 percent of their colonies due to colony collapse disorder. The cause is still a mystery to researchers, who count viruses, pesticides and migratory beekeeping as possible culprits. A team of bee inspectors with the Illinois Department of Agriculture hasn't confirmed a case within the state, though surveys by Bee Alert Technology Inc. in Missoula, Mont., report differently. The company surveys beekeepers and found multiple cases of the disorder in at least 36 states, including Illinois. "I'm concerned about CCD but also have confidence in scientific community," said Haller. "We're not used to such an epidemic level of die-off but they're working to see what's causing this and working toward solutions."